15 Teams to 11 Countries on 4 Continents! To find out where we are sending people this year, check out our website: cruhighschool.com/go-global. Seven of our teams were on location this spring, comprising of 99 people! I have heard so many amazing stories of how the Lord worked, but I just couldn’t help share Christine’s story, one of staff members in Denver. I hope you find it as encouraging as I did. Please pray for the 8 additional teams we are sending this summer. Christine (in blue) with Benjamin on her left. Lying on the graveled cement, I began to regain consciousness. Two unfamiliar faces asked me questions I struggled to find the answers to. I couldn’t understand why I was on the ground and why I was badly bleeding. The more coherent I became, the more the pieces started to fit together. It was four days before leaving for Ecuador and I had just had my second seizure. I was angry. I was broken. The timing was less than ideal. 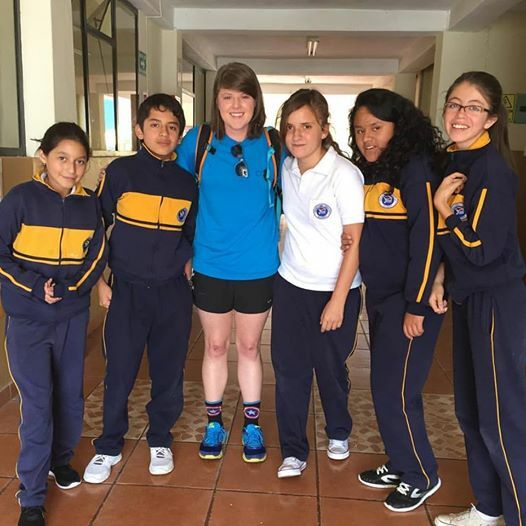 Yet, eight days later, inside a small classroom in Ecuador, God would begin a process of restoration unlike anything I could have ever imagined. Before gathering my thoughts on how to respond, a student also sitting in the circle boldly interrupted the conversation to ask, “What happened to your legs? ?” My legs, as well as my hands and elbow had been deeply wounded when I fell onto the gravel during my seizure. The wounds were so severe they almost kept me from coming to Ecuador. Little did I know, these same wounds would be used by God to start a life-changing conversation. Immediately, Benjamin, who had previously shared, shot his hand into the air. “That’s what I have!! That’s why I’ve been to the hospital four times! !” I was shocked. Tears began streaming down our faces as he described the amount of fear he lives in not knowing if or when another seizure could happen. He went on to share, “But I know God is good. I know he loves me. He can give me peace and security.” Our conversation continued with discussing how we can’t have hope in our health, because our health isn’t promised to us. But we are able to have confident hope in heaven, by having faith in Jesus and his death on the cross for us. By faith, our relationship with God is no longer broken because of our sin, but restored. We are promised to live eternally with Christ, in perfect bodies, with no pain and suffering. The principal, teacher, and translator (who were all unaware Benjamin even had epilepsy) were wiping away tears in response to the Gospel being proclaimed in such a personal way. I’m not sure how exactly God used the conversation on the hearts of the people in the classroom, but I know it was a moment I will look back on for the rest of my life. I wasn’t prepared for God to use a thirteen-year-old boy as the tool to begin to restore my heart with truths about who He is and what He’s promised. It is so clear to me that God orchestrated the entire conversation. If the seizure and the wounds had not happened, I’m not sure if the conversation would have ever started. God knows me. God sees me. He is good and uses everything according to His purposes, even seizures.